Regina is a senior in high school with a big problem. She has a pretty face, she has a slim athletic body, she's very intelligent, she's six feet eight inches tall. Regina decides to be a reporter for the Centurion, the high school paper. As a part of her job, Regina gets to interview the new center for the Centurions basketball team. James Marr is a white guy, seven feet one inch tall. James doesn't go to classes, but he does study in the library. He has already taken the SAT and has 2400. The maximum SAT score is 2400. Regina does a bit of research and finds out a lot more about high school boy's basketball that she really wanted to know. She also finds out that, if the Centurions can win the state high school basketball championship, poor as a church mouse Jim Marr can get a good paying job with a local stock broker and be able to afford a girlfriend. All Regina has to do is to figure out how to enable the Centurions to win the high school boys state basketball championship and then she can snag James Marr. Do you have any idea how hard it is for a tall girl to find a boy of suitable height? Regina determines to find a way. MY NAME IS REGINA. I’m a senior, enrolled at Central High School. Right now, there are some good things and some bad things going on in my life. Let’s start with the good stuff and then the bad stuff. Before I ever got into high school, I was a model. I went to an interview with an agency and they liked the way that I looked, so I got some training and then I got this photo shoot with a local department store. The clothes that I modeled were a big success that season and I got some more photo shoots. I had my own model portfolio and stuff. I found out, from the modeling agency, that I had a really pretty face, a good figure, photographed well, I looked good in the junior miss clothes and I would become one of their top models later on. My future was so bright! Then, I developed this problem with the top of my head. It was suddenly bye, bye modeling career. I graduated from middle school and I went to high school and I made a big mistake early on in my high school career. What I did was to get almost straight A grades. I also got top scores on the standardized tests. Actually, there are a lot of boys who like very intelligent girls. Unfortunately, I don’t know on which planet those boys are located. It was suddenly bye, bye Homecoming Queen. I did get along okay with the other girls and someone talked me into going out for the girls’ volleyball team. I not only made the team, hey, I became a star! I was really good at volleyball and so was our team. Unfortunately, one reason the team was so good was that the coach had hired (yes, I said hired) one of our star players. The league found out and not only did we have to forfeit all of our games that year, the league wouldn’t let us play for a whole year, next year, my senior year. It was suddenly bye, bye sports star. Okay, I worked the summer before my senior year in my daddy’s office. My daddy is a stock broker. I learned a lot about the stock broker thing through the summer, but I don’t really want to be a stock broker. Also, there’s a guy named Dean, who works at my daddy’s office. He calls me, ‘Long Tall Sally’ and I don’t need that at all. I also don’t need Dean’s hands ‘accidentally’ brushing certain parts of my body. Bye, bye Regina the stock star. I start my senior year of high school and, since I’m no longer a volleyball player, I decide to be a reporter for the Centurion, the school paper. Because I was on the girls’ volleyball team before, I do mostly sports reporting. I don’t like the attitude of the guys on the sports teams (called the Centurions), but I stick with the reporter thing, because it’s another extracurricular activity and I want to go to a local, very exclusive, college. I have the grades to get in there, but I also need extracurricular activities to spiff up my college application. I probably would have quit the reporter job, but we have a championship girls’ soccer team and several of the girls are either from other countries or are first generation, born here in the USA. I learn a lot about how girls live in other countries and about the changes that they have to adapt to, once they get to this country. The local community paper decides to run feature sports section stories about the girls of the soccer team, on Mondays. So, I get my byline in the local paper. Having my byline in the local paper is another very good thing for my standing with the local college admissions department. It gets to be basketball season and I get to do stories about the girls who play on our Lady Centurions basketball team. My problem with the top of my head isn’t too big a problem for the basketball girls and we get along very well. In fact, they want me to try out for the team. Unfortunately, I have never played basketball before and I don’t want to start learning about basketball in the middle of my senior year. 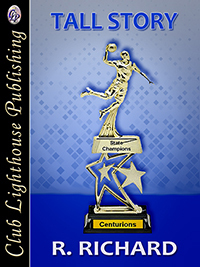 I also have to do stories about the boys who play on our Centurions basketball team. My problem with the top of my head isn’t too big a problem for the basketball boys and they indicate to me that they just might be willing to take me out, providing that I’m willing to do what I’m not willing to do. There are some rather nasty verbal exchanges with the boys and I’m just about to give up on the reporter thing.